I’m jumping into Christmas decor with both feet today, and what better way to kick it off then with a huge group of very talented bloggers. 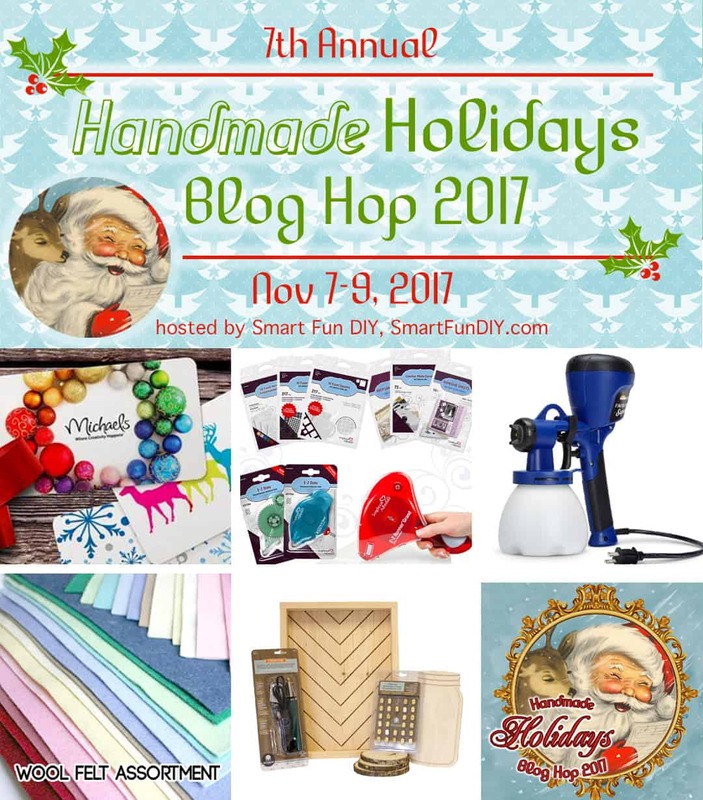 Today is the 7th annual Handmade Holidays blog hop, 3 days of food, gifts, crafts and decor for the holidays. Plus a giveaway so you can get creative this season. I am sharing an easy to make colorful Christmas pallet sign. I want to add some color and fun into my decor this year, a bit of a shift from my neutral holiday decor of years past. Take a look at how easy this is to make and be sure to scroll all the way down to view more projects and enter the giveaway. I shared this colorful Christmas pallet on Facebook live a few weeks ago. Be sure you are following me on Facebook and join me Friday nights for Live crafts and lots of fun. 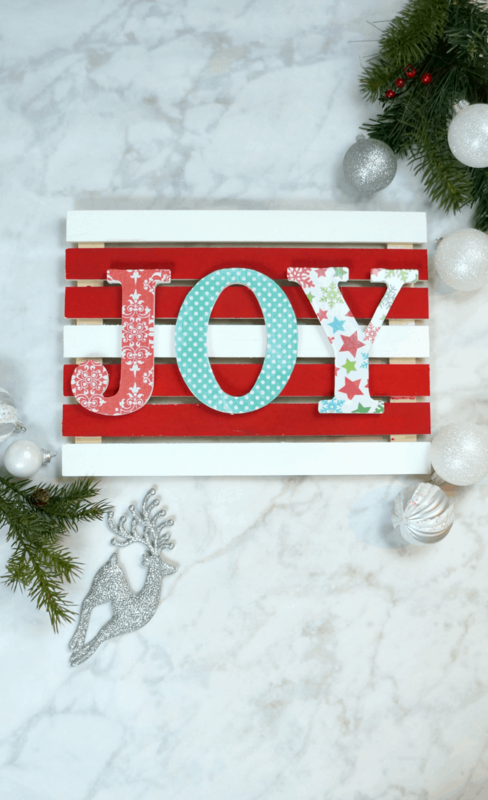 I walk you through how to make this colorful Christmas sign in this video, be sure to check it out. Below are the supplies I used. I started by painting the slats red and white and the edges of the letters with white craft paint. Once everything was dry, I traced and cut out letters from colorful patterned scrapbook paper. I used mod podge to adhere the paper to the letters. Once they were dry I used hot glue to add the letters to the pallet sign. 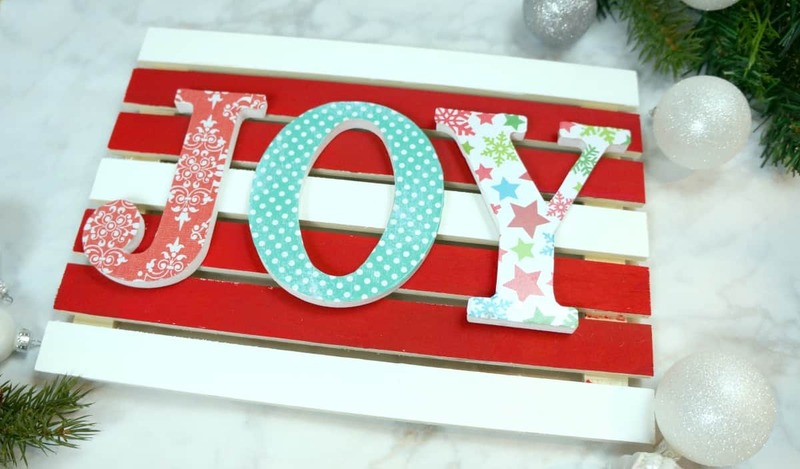 This colorful Christmas pallet sign pops with raised letters and lots of color. I am looking forward to displaying this on my mantle for the season. Now take a look at these amazing handmade holiday decor projects. Super fun sign! I love the festive mix of patterned paper. I remember watching you make this sign on your facebook live! What a cheerful and joy ful sign! Love your sweet joy sign and the colours you chose! This would make lovely gifts too!